Residing inside the historic Agassiz Mansion built in 1875, The Dining Room at Castle Hill Inn has been the backdrop of memorable occasions for over a century. The Forbes Four Star restaurant boasts a prix fixe menu showcasing the talents of Chef Lou Rossi and his renowned culinary team. We are grateful to provide our guests with a mesmerizing experience in a location that is second to none in New England—not only for the view, but for the bounty provided by our surrounding lands. These range from local seafood surrounding Aquidneck Island, seasonal produce, and artisanal cheeses crafted throughout the region. We hope to serve you a meal that will speak both to the nostalgia and tradition of New England cooking, while inviting you to experience something new along the way. The wine list features over 800 selections, and has been awarded the “Best of Award of Excellence” from Wine Spectator for ten years running. 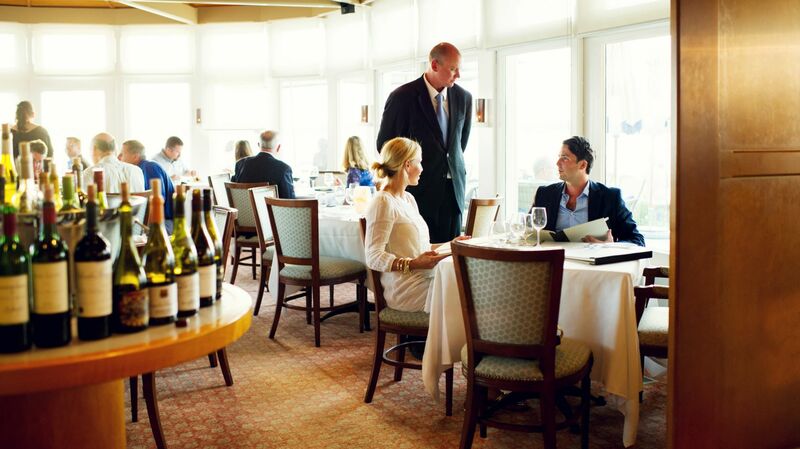 Come experience one of the best restaurants in Newport today. Mansion Bar 5:00pm – 10:00pm daily for food and beverage, beverage service daily till midnight (if necessary). * For information and menus regarding lunch & brunch service, please see The Lawn restaurant link.